See the success of other regional transportation partnerships, The Ohio State University Extension Noble County Office researched and shared the need for more structured access to public transportation to the Noble County Board of Commissioners. While limited access to transportation exists in the greater Noble County community through eligibility-specific programs such as Veterans Services, Senior Services or the Medicaid program, no general public transportation is available. 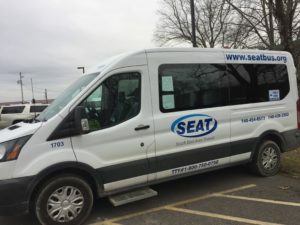 Research identified several successful rural regional transportation models and one partner, Southeast Area Transit (SEAT), a Regional Transit Authority (RTA) serving nearby Guernsey and Muskingum Counties, came to the table to offer a pilot program. SEAT agreed to launch a six-month transportation pilot in 2019 and to help determine service needs. As a social determinant of health, access to high-quality, affordable transportation is fundamental to mental, physical and emotional well-being. [ii] The partnership window initially opened with a contract between SEAT and the Noble County Job and Family Services program for Medicaid non-emergency medical transportation. Previously providing only gas vouchers for transport, the JFS Director saw a greater need. Additional research and conversations led to a meeting with county leaders and representatives from the transit agency which yielded a pilot program offer. The pilot program will be a hands-on opportunity to introduce services to the rural communities, further determine needs and opportunities for additional contract services and future funding options. Barriers to rural transportation systems include long travel distances, low population density, and lack of basic public transit infrastructure (vehicles, staffing). Access to transportation impacts the well-being of rural residents with issues as varied as accessing food, social support, education, employment, and community and health services. Partnerships assist with identifying deficiencies, recommending improvements and developing real-world implementation strategies (especially when rural resources are at a minimum.) Partnerships can also provide coordination of services and help improve transportation reach and efficiency, as well as sustainability. Following the pilot program, partners will consider next steps for expansion of services with the goal to provided safe, reliable, courteous public transportation in a community where there previously was very little offered.